“We’re just so proud of Raymond and the legacy that he has left. He died the same way that he lived. He went to the aid of somebody that was in trouble. He gave the ultimate sacrifice.” Andre Taavel’s voice trembles slightly as he speaks lovingly about his big brother. On April 17th, 2012 Raymond Taavel intervened when he witnessed a man being beaten. In trying to end the violence against the victim the attacker turned his attention to Raymond. Raymond was beaten to death by Andre Noel Denny. The 32 yr. old was a psychiatric patient at the East Coast Forensic Hospital and he failed to return to the hospital after being let out on a one-hour pass. 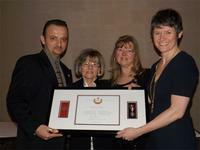 In late October, Raymond was posthumously awarded the Queen’s Diamond Jubilee medal. 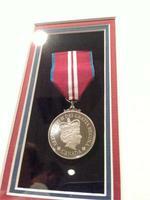 The medal is awarded to individuals who demonstrate dedication to community and nation. After his murder several nominations were put forward by the people in Halifax who worked alongside him on many causes. Having just returned from Halifax a few months prior to the original award ceremony it just wasn’t practical for the family to return. The MP of Halifax and Raymond’s friend, Megan Leslie, put the wheels in motion to organize a second ceremony in Sault Ste. Marie. She travelled to the Sault and during a celebration on Friday night Megan presented the award to Raymond’s mother, Susan Blatter. LOCAL2.ca is a local news and information platform and portal based in Sault Ste. Marie, Ontario. It is owned by Raymond Taavel's nephew.